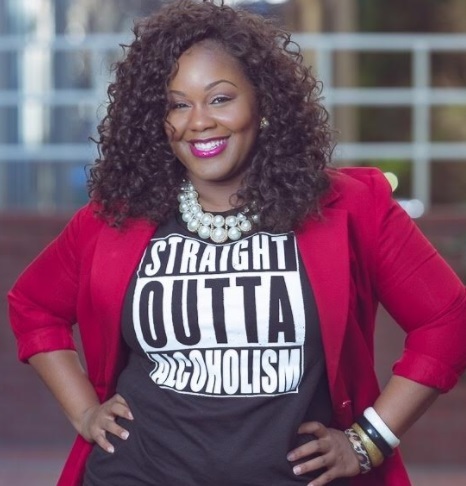 Ebony K. English is a mother, an influencer, speaker, and mentor, Class of 2002 graduate of Columbia High School, a proud Benedict College Tiger, and a true southern girl born and raised in Columbia, South Carolina. Growing up Ebony struggled to find her place in the crowd, and always felt like the underdog. At a very young age she battled with insecurities, anger, resentment and a broken heart due to the absence of her biological father. In attempt to fill her fatherless void, she often found herself suffering in silence and using alcohol as a coping mechanism. After years of alcohol dependency she was delivered from alcoholism in January of 2015 and has since transferred all dependency to God; our one true healer. Turning pain into purpose, she is now an advocate for silent sufferers, Certified Recovery Coach, a Peer Support Specialist to homeless adolescents in her community, Founder of Saved, Sober & Sitting Pretty and P.A.C.E Yourself Youth Foundation. Saved, Sober and Sitting Pretty’s mission is to empower women and walk alongside them as they design their purposed filled lives and declare victory over the battle of alcoholism and other addictions. While P.A.C.E Yourself mission is to encourage the youth to prevent alcohol consumption and educate themselves in a time when they are most susceptible to the temptations of engaging in risky behaviors. I commit to loving people just where they are in life. I don’t pass judgment on anyone and their temporary circumstances. I believe that pure, organic love can and will one day heal all the hurt of this world. I intentionally spread love with every chance that I get. I was just recently told that my gift is loving people back to life! I receive that! I am the best version of myself when I operating in authenticity. Being authentic allows me to make self- honoring choices and to stand firmly in who I am to the core. It is imperative for me to be comfortable in my truth so that I am able to show up and fulfill the highest purpose for my life not only for myself but also for the people whose healing is attached to my story. I aspire to be a world renowned Recovery Coach and an ambassador in the world of substance abuse recovery. I am a change agent that will inspire women around the world to live their purpose filled lives as I walk alongside them on their path to self-discovery, healing and embracing their truths. My greatest success is without a doubt my sobriety! Prior to choosing sobriety, I had given up on myself more times than I would like to remember or talk about. My sobriety is a daily reminder that I can accomplish anything that I put my mind to. I have had tremendous success in waking up every morning and putting my life, dreams and goals ahead of fear and distractions. Sobriety has offered me a life I had never imagined when I was literally drowning my pain and sorrows in alcohol. I have been blessed with so many opportunities to be a blessing in the lives around me just by sharing my journey of substance abuse to a woman of substance. It may sound a little cliché but changing my mind, has literally changed my whole life. On most days I barely recognize my life, but every day I am grateful for the process that has made me who the world is witnessing! My most challenging moment has also come in my sobriety. It was on November 25th, 2016 when I received a phone call that my cousin had been killed. It was challenging because my mind and body automatically snapped back to the desire to be numb, the only way I knew how to do that was to drink. However, I refrained from falling back into alcohol’s deceptive ways. My sobriety is and always will be priority. I would’ve never forgiven myself for returning to use. My motto is “no one can do everything, but we all can do something to be the change we desire to see in this world”. My favorite people are my grandmother, my 10 year old son Jayllen and my cousin Matt. One of my role models is Michelle Obama, ever since I heard her speech at the 2008 DNC when she stated “you haven’t reached success until you have reached back and pulled someone else up”, that has become a way of life for me. Phil Knight is also one of my role models. We see Nike as the brand it is today, but after reading “Shoe Dog” I learned the true power of consistency and what it means to push through and finish. Our dreams deserve to live and not die; we are the only ones that have total control of that. Speaking of Nike, LeBron James would also have to make the list, being that we are the same age; LeBron’s success has inspired me to ignore the noise the naysayers are making around me, stay focus and strive for greatness!! I haven’t done a lot of traveling, but of the places I have been blessed to visit I would have to say that New Orleans, Louisiana has been my favorite destination. My favorite products are all of my apple products and my son’s beat pill. Being lovers of music it allows us to listen to our favorite tunes everywhere we go. Educating youth on the dangers of alcohol consumption, sharing my story to spread hope, inspiring others to become the best version of who they were meant to be and being a mother that my son can be proud of!